We wouldn’t want you to stress over the gift for the THE BEST MOM EVER, so here’s an early reminder that Mother’s Day is May 13, 2012 and we have a few gift suggestions for the Moms in your life. Do you know a Mom who spends her spring days in the Garden? Custom Granite signs area a great choice for her. 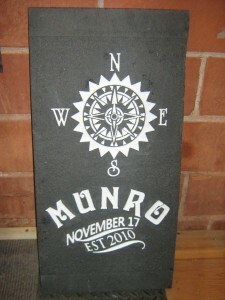 They can be customized with sandblasted text, graphics and even colour to add some flair. These signs are durable and look fantastic in flower beds, near slate or interlocking brick. A cheery warm engraved wood welcome sign will compliment any entrance-way. These wood signs have a simple elegance that will show just how thoughtful you are. The neutral tones were chosen to match several different decor schemes and the sign’s size is perfect for a front door of a home or cottage. A little creativity can go a long way! Choosing a custom designed sandblasted cedar wood sign for her gift will make it a Mother’s Day to remember! Why not get Mom something that best represents her? Choose the size, shape, colours, text and graphics to customize the look of a residential sign. 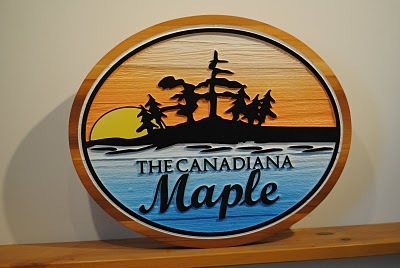 These custom engraved wood signs are great as gifts for homes, cottages and vacation properties. Need something altogether different? 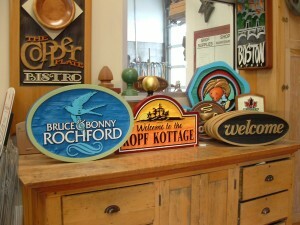 We have lots of unique ways to customize a sign for you. Need some inspiration? Take a look at our Sign Depot Pinterest Boards. They have been known to ignite the creative spark in all of us. With Mother’s Day less than a month away, make sure to contact us today. The Sign Depot has lots of options to suit you budget, and we’ll make sure you’re still Mom’s Favorite!